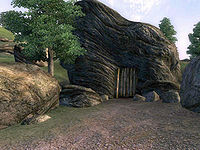 Wellspring Cave is a small cave east of the Imperial City containing necromancers (quest-related). The cave contains only one zone, Wellspring Cave, but it also provides access to Wellspring Grove. This cave can be entered and fully explored without starting the related quest. In this case, however, it will be completely uninhabited. In particular, Zahrasha's corpse will not be present, and therefore door D cannot be opened. Door D provides access to an island, Wellspring Grove, in the middle of the lake. This island is otherwise nearly inaccessible because it is surrounded by steep cliffs and transparent barriers. This dungeon contains 12 Cairn Bolete plants. 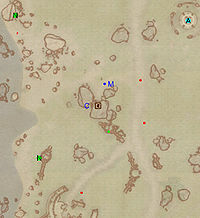 This location's map marker (M on map) is named Wellspring Cave (editor name WellspringCaveMapMarker). The entrance door is SSW of the marker, 40 feet away. You enter this cave through door C. The door at the other end, D, provides access to Wellspring Grove. Be careful upon entering as you will find two necromancers ready to greet you immediately inside. There is nothing of interest in the underwater section of the main cave. If you accidentally fall in, you can get back out using the tunnel at the west end of the channel. 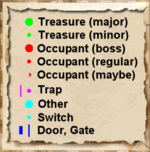 The last room contains Zahrasha's corpse (k), a necromancer and two bedrolls (b) which you can sleep in. 6 Necromancers. These necromancers will not appear until the related quest is started. Afterwards, they will continue to respawn if you return to the cave. Wellspring Grove is a small island located in Lake Rumare. Although it's technically possible to climb the steep cliffs surrounding the grove, you are still unable to enter it as there are invisible one-way walls surrounding the island along the top that prevent your access. The grove is located at coordinates: Tamriel 13, 13. Noveni Othran (Necromancer; non-respawning) and 2 Necromancers (non-respawning) are near the door. When you enter the grove, she will approach you and speak with you (unless you kill her first), regardless of any stealth, Chameleon or Invisibility effects you may have active. After speaking, she will automatically see you, and usually the other two Necromancers will as well at that point. To avoid a fight with all three, when you enter the grove, immediately turn to your left and walk around behind the entrance to the grove. This should conceal you from the other two, leaving only Noveni to be dealt with. The other two can then be approached with stealth as normal, if desired. 1 Stone Chest (contains Unfinished Staff once related quest is started; non-respawning) is at location C on map. Eletta's corpse is at location E on map.